Metal bending is a powerfully visual effect. Coil accomplishes metal bending by using some common magic moves and sleights which you probably already know. Because of these familiar moves, learning Coil will be faster and easier. 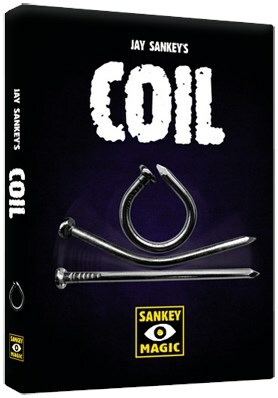 Jay Sankey adds his usual out-of-the-box flair to a nail bending effect. Not only is the bend eye-poppingly visual but you are left with a usable object at the end. Bend a nail until it forms a ring shape which you can then wear on your finger or use later in another routine! You can also perform COIL as a closing effect for a powerful reputation maker. Thanks to the specially machined gimmick included with the full-length DVD, the nail can be closely examined before, after, and even during the amazing sequence of step-by-step bends. If you’re looking for a visual and flashy bit of impossible metal bending with something other than cutlery or coins, Coil may well spike your interest.